Under the guise of preparing and teaching us in self-government, the American imposition of public education was designed for the Filipinos to be Americanized in their outlook; and this was greatly attained by the use of English as the only medium of instruction (all part of subtle but extremely effective "cultural" imperialism). During their 50-year rule, public education was given the greatest priority and was actually run as part of the US Department of the Army to ensure compliance until 1935. Thus years thereafter, America was able to leave peacefully since the educational system has guaranteed and continually produced "little brown brothers" who wittingly and unwittingly thought, loyally worked and ruled for America. America did not need anymore to have American occupational troops in the islands! In addition, the practiced "free trade" during the entire colonial period and its later postwar imposition via Bell Trade Act our co-opted ruling elites perpetuated American dominance in all significant business and industries; and embedded our taste for imported goods/culture and thus practically killing any nascent native industrialization, keeping us mainly as a source of supply for agricultural products and strategic minerals, and losing our patrimony, sense of national history, national unity and national identity. A critical study of American history will show that the Americans came not to help free the Filipinos from the Spaniards (the revolutionaries have them surrounded until the Americans joined in and fooled them to stay put until their reinforcements arrived). The Americans came because during that moment in time in history, Americans saw their need for a fueling station for their growing navy, recognized the need to expand their sources of supply for raw materials, and new markets for their excess products in Asia, especially the illimitable Chinese market, and saw the Philippines as the gateway for all. Education is a vital weapon of a people striving for economic emancipation, political independence and cultural renaissance. We are such a people. Philippine education therefore must produce Filipinos who are aware of their country's problems, who understand the basic solution to these problems, and who care enough to have courage to work and sacrifice for their country's salvation. 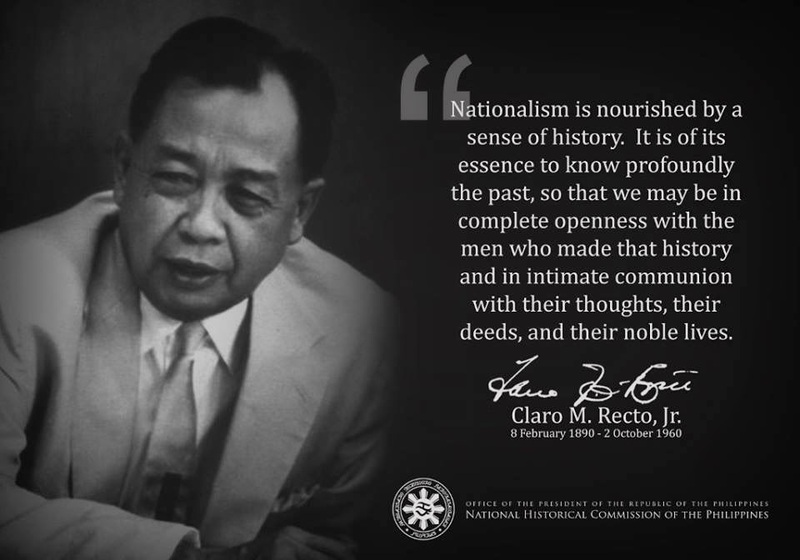 In recent years, in various sectors of our society, there have been nationalist stirrings which were crystallized and articulated by the late Claro M. Recto, There were jealous demands for the recognition of Philippine sovereignty on the Bases question. There were appeals for the correction of the iniquitous economic relations between the Philippines and the United States. For a time, Filipino businessmen and industrialists rallied around the banner of the FILIPINO FIRST policy, and various scholars and economists proposed economic emancipation as an intermediate goal for the nation. In the field of art, there have been signs of a new appreciation for our own culture. Indeed, there has been much nationalist activity in many areas of endeavor, but we have yet to hear of a well-organized campaign on the part of our educational leaders for nationalism in education. Although most of our educators are engaged in the lively debate on techniques and tools for the improved instructions, not one major educational leader has come out for a truly nationalist education. Of course some pedagogical experts have written on some aspects of nationalism in education. However, no comprehensive educational programme has been advanced as a corollary to the programmes for political and economic emancipation. This is a tragic situation because the nationalist movement is crippled at the outset by a citizenry that is ignorant of our basic ills and is apathetic to our national welfare. Some of our economic and political leaders have gained a new perception of our relations with the United States as a result of their second look at Philippine-American relations since the turn of the century. The reaction which has emerged as economic and political nationalism is an attempt on their part to revise the iniquities of the past and to complete the movement started by our revolutionary leaders of 1896. The majority of our educational leaders, however, still continue to trace their direct lineal descent to the first soldier-teachers of the American invasion army. They seem oblivious to the fact that the educational system and philosophy of which they are proud inheritors were valid only within the framework of American colonialism. The educational system introduced by the Americans had to correspond and was designed to correspond to the economic and political reality of American conquest. The most effective means of subjugating a people is to capture their minds. Military victory does not necessarily signify conquest. As long as feelings of resistance remain in the hearts of the vanquished, no conqueror is secure. This is best illustrated by the occupation of the Philippines by the Japanese militarists during the Second World War. Despite the terroristic regime imposed by the Japanese warlords, the Filipinos were never conquered. Hatred for the Japanese was engendered by their oppressive techniques which in turn were intensified by the stubborn resistance of the Filipino people. Japanese propagandists and psychological warfare experts, however, saw the necessity of winning the minds of the people. Had the Japanese stayed longer, Filipino children who were being schooled under the auspices of the new dispensation would have grown into strong pillars of the Greater East Asia Co-Prosperity Sphere. Their minds would have been conditioned to suit the policies of the Japanese imperialists. "....General Otis urged and furthered the reopening of schools, himself selecting and ordering the textbooks. many officers, among them chaplains, were detailed as superintendent of schools, and many enlisted men, as teachers..."
"...This appropriation is recommended primarily and exclusively as an adjunct to military operations calculated to pacify the people and to procure and expedite the restoration of tranquility throughout the archipelago..."
Thus, from its inception, the educational system of the Philippines was a means of pacifying a people who were defending their newly-won freedom from an invader who had posed as an ally. The education of the Filipino under American sovereignty was an instrument of colonial policy. The Filipino has to be educated as a good colonial. Young minds had to be shaped to conform to American ideas. Indigenous Filipino ideals were slowly eroded in order to remove the last vestiges of resistance. "...To most Americans it seemed absurd to propose that any other language than English should be used over which their flag floated. But in the schools of India and other British dependencies and colonies and, generally, in all colonies, it was and still is customary to use the vernacular in the elementary schools, and the immediate adoption of English in the Philippine schools subjected America to the charge of forcing the language of the conquerors upon a defenseless people. Arrangements were promptly made for enlisting a small army of teachers in the United States. At first they came in companies, but soon in battalions. The transport Thomas was fitted up for their accommodations and in July, 1901, it sailed from San Francisco with six hundred teachers -a second army of occupation- surely the most remarkable cargo ever carried to an Oriental colony." "..That there shall be appointed by the President, by and with the advice and consent of the Senate of the United States, a vice-governor of the Philippine Islands, who shall have all the powers of the governor-general in the case of a vacancy or temporary removal, resignation or disability of the governor-general, or in case of his temporary absence; and the said vice-governor shall be the head of the executive department known as the department of Public Instruction, which shall include the bureau of education and the bureau of health, and he may be assigned such other executive duties as the Governor-General may designate..."
Up to 1935, therefore, the head of this department was an American. And when a Filipino took over under the Commonwealth, a new generation of "Filipino-American" had already been produced. There was no longer any need for American overseers in this filed because a captive generation had already come of age, thinking and acting like little Americans. This does not mean, however, that nothing that was taught was of any value. We became literate in English to a certain extent. We were able to produce more men and women who could read and write. We became more conversant with the outside world, especially the American world. A more widespread education such as the Americans would have been a real blessing had their educational programme not been the handmaiden of their colonial policy. Unfortunately for us, the success of education as a colonial weapon was complete and permanent. In exchange for a smattering of English, we yielded our souls. The stories of George Washington and Abraham Lincoln made us forget our own nationalism. "...The programme of cultural assimilation combined with a fairly rapid yielding of control resulted in the fairly general acceptance of American culture as the goal of Filipino society with the corollary that individual Americans were given a status of respect..."
This in a nutshell was (and to a great extent still is) the happy result of early educational policy because, within the framework of American colonialism, whenever there was a conflict between American and Filipino goals and interests, the schools guided us toward thought and action which could forward American interests. The educational system established by the Americans could not have been for the sole purpose of saving the Filipinos from illiteracy and ignorance. Given the economic and political purposes of American occupation, education had to be consistent with these broad purposes of American colonial policy. The Filipinos had to be trained as citizens of an American colony. "..Clearly, from the Filipino point of view, the United States was now determined to 'spare them from the dangers of premature independence,' using such force as might be necessary for the accomplishment of that pious purpose..."
Despite the noble aims announced by the American authorities that the Philippines was theirs to protect and guide, the fact still remained that these people were a conquered nation whose national life had to be woven into the pattern of American dominance. Philippine education was shaped by the overriding factor of preserving and expanding American control. To achieve this, all separatist tendencies were discouraged. Nay, they had to be condemned as subversive. With this as the pervasive factor in the grand design of conquering a people, the pattern of education, consciously or unconsciously, fostered and established certain attitudes on the part of the governed. These attitudes conformed to the purposes of American occupation. The first and perhaps the master stroke in the plan to use education as an instrument of colonial policy was the decision to use English as the medium of instruction English became the wedge that separated the Filipinos from their past and later to separate educated Filipinos from the masses of their countrymen. English introduced the Filipinos to a strange, new world. With American textbooks, Filipinos started learning not only a new language but also a new way of life, alien to their traditions and yet a caricature of their model. This was the beginning of their education. At the same time, it was the beginning of their mis-education, for they learned no longer as Filipinos but as colonials.They had to be disoriented form their nationalist goals because they had to become good colonials. The ideal colonial was the carbon copy of his conqueror, the conformist follower of the new dispensation. He had to forget his past and unlearn the nationalist virtues in order to live peacefully, if not comfortably, under the colonial order. The new Filipino generation learned of the lives of American heroes, sang American songs, and dreamt of snow and Santa Claus. The nationalist resistance leaders exemplified by Sakay were regarded as brigands and outlaws. The lives of Philippine heroes were taught but their nationalist teachings were glossed over. Spain was the villain, America was the savior. To this day, our histories still gloss over the atrocities committed by American occupation troops such as the Water Cure and the "re-concentration camps." Truly, a genuinely Filipino education could not have been devised within the new framework, for to draw from the wellsprings of the Filipino ethos would only have lead to a distinct Philippine identity with interests at variance with that of the ruling power. Thus, the Filipino past which had already been quite obliterated by three centuries of Spanish tyranny did not enjoy a revival under American colonialism. On the contrary, the history of our ancestors was taken up as if they were strange and foreign peoples who settled in these shores, with whom we had the most tenuous of ties. We read about them as if we were tourists in a foreign land. Control of the economic life of a colony is basic to colonial control. Some imperial nations do it harshly but the United States could be cited for the subtlety and uniqueness of its approach. For example, free trade was offered as a generous gift of American altruism. Concomitantly, the educational policy had to support his view and to soften the effects of the slowly tightening noose around the necks of the Filipinos. The economic motivations of the American in coming to the Philippines were not at all admitted to the Filipinos. As a matter of fact, from the first school-days under the soldier-teachers to the present, Philippine history books have portrayed America as a benevolent nation who came here only to save us from Spain and to spread amongst us the boons of liberty and democracy. The almost complete lack of understanding at present of those economic motivations and of the presence of American interests in the Philippines are the most eloquent testimony to the success of the education for colonials which we have undergone. What economic attitudes were fostered by American education? It is interesting to note that during the times that the school attempts to inculcate an appreciation for things Philippine, the picture that is presented for the child's admiration is an idealized picture of a rural Philippines, as pretty and as unreal as an Amorsolo painting with its carabao, its smiling healthy farmer, the winsome barrio lass in the bright clean patadyong, and the sweet nipa hut. That is the portrait of the Filipino that our education leaves in the minds of the young and it hurts in two ways. First, it strengthens the belief (and we see this in adults) that the Philippines is essentially meant to be an agricultural country and we can not and should not change that. The result is an apathy toward industrialization. It is an idea they have not met in school. There is further, a fear, born out of that early stereotype of this country as an agricultural heaven, that industrialization is not good for us, that our national environment is not suited for an industrial economy, and that it will only bring social evils which will destroy the idyllic farm life. Second, this idealized picture of farm life never emphasizes the poverty, the disease, the cultural vacuum, the sheer boredom, the superstition and ignorance of backward farm communities. Those who pursue higher education think of the farm as quaint places, good for an occasional vacation. Their life is rooted in the big towns and cities and there is no interest in revamping rural life because there is no understanding of its economic problems. Interest is limited to artesian wells and handicraft projects. Present efforts to uplift the conditions of the rural masses merely attack the peripheral problems without admitting the urgent need for basic agrarian reform. With American education, the Filipinos were not only learning a new language; they were not only forgetting their own language; they were starting to become a new type of American. American ways were slowly being adopted. Our consumption habits were molded by the influx of cheap American goods that came in duty-free. The pastoral economy was extolled because this conformed with the colonial economy that was being fostered. Our books extolled the western nations as peopled by superior beings because they were capable of manufacturing things that we never thought we were capable of producing. We were pleased by the fact that our raw materials could pay for the American consumption goods that we had to import. Now we are used to these type of goods, and it is a habit we find hard to break, to the detriment of our own economy. We never thought that we too could industrialize because in school we were taught that we were primarily an agricultural country by geographical location and by the innate potentiality of our people. We were one with our fellow Asians in believing that we were not cut out for an industrialized economy. That is why before the war, we looked down upon goods made in Japan despite the fact that Japan was already producing commodities at par with the West. We could never believe Japan, an Asian country, could attain the same superiority as America, Germany or England. And yet, it was "Made in Japan" airplanes, battleships and armaments that dislodged the Americans and the British from their positions of dominance during the Second World War. This is the same attitude that has put us out of step with our Asian neighbors who already realize that colonialism has to be extirpated from their lives if they want to be free, prosperous, and happy. It is not miseducation of the filipino, IT IS MISAPPLICATION OF EDUCATED FILIPINO MINDS, Politically and economically that's what is is. Unless we brainwashed the new generation of filipinos we will always have these viruses and bacterias within the filipino minds. There is no solution to our problems if we do not play in the same field, same goal, same love for our country, same of everything to save our country in ruins for the sake of our children that is not even born. I was going to forward the Lessons below from Noah's Ark, in green font, that a slim (that is not short for slimy) lawyer from Chicago sent me more than one year ago. Then I realized that someone has written that all see ever needed to know, she learned from kindergarten, and she sounds simple-minded. Silly lessons from her, or from kindergarten or Noah, are not really apt for good minds. Hence the comments of mine below, written in red, came up. ONE: Don't miss the boat. (Or, you may. An airplane is faster.). TEN: Remember, the Ark was built by amateurs; the Titanic by professionals. (However, also note that amateurs created the Philippine Constitution's Article on economics that has killed, and up to today, 71 years later, still kills Filipinos, and crafted a Filipino nationalism that imprisons Filipinos behind a wall of economic ignorance). Sorry, the comment did not upload your Noah's Ark images. In the global jungle, eat lunch, or be lunch. Renato Constantino never ate lunch, nor offered a recipe for lunch.. He and Recto only had ideas to build walls of protectionism.... i.e. building walls against pigs. Then the Tigers of global technology came and ate them. Hey Bert, technological Tigers are eating you, too. You use imported computers, imported cell phones, imported electricity (i.e., produced by imported oil and imported generators and imported tractors to build dams), but you don't help to earn dollars in a world of technological Tigers. So, your imports are bleeding the Central Bank's vaults of dollars, the foreign technological Tiges are ripping your and our hearts out through you and Filipinos buying all those Tiger attractive products. You've got to ride with Tiger allies to eat other Tigers worldwide. You must help build a Tiger Dell Philippines to eat up American Tiger Dell, or a Tiger Hyundai Philippines to eat up Tiger Hyundai Korea and Tiger Hyundai global, etc.! That is the crafty method Renato Constantino and you leftist guys are missing. Use Tigers as allies to eat up other Tigers. Such a Tiger Hong Kong alliance beat up Tiger America. Hong Kong ate Americans for lunch. Even Filipinos were their lunch, torn up by Tiger claws from Hong Kong consisting of radios, cameras, computer mice made in HK and sold in the Philippines. Ha, we must ride with Tigers. If we are not doing that, as leftists are not, then they have already fallen off the Tiger, and are being eaten up! Eat lunch or be lunch! I suggest that you address your ideas to those in government than to me, they can make them happen; and you'll be well credited. Rather than attack the dead who can not respond. Your suggestion to get the government going with my proposals is much welcome. I surely must work on that. But, if I did, I'd use only 1% of my time on it. And while I am at it, could you help? Independently of me, could you work on government? I mean, must I do all the work? I need your help because you could have a better public relations personality than mine. I am impatient with most officials. I see them as not competent, visionary, speedy. Even if honest and well-meaning, they can slow you down. The problem is that Presidents and officials are giants and minions bound by bureaucracies and politics, and worse, by ignorance and incompetence, and thus are usually unable to soon fix the needs of poor nations. Of course there are exceptions-- Asian Tiger leaders Lee Kuan Yew. Ramos could have been an exception, too, but did not quite go over the hump completely, and the boulder he had pushed to near the top rolled back down. Foreign direct investment inflows have grown negatively during Gloria since the 1999-2000 high points during Estrada, despite the strong rise in investment inflows in 2005 from the depressed level during 2004. There has never been negative direct investment inflow growth under any President since global data on direct investment flows started to be published (1970s). I do not criticize Gloria for corruption, since corruption has been a great power for nation-building in the right hands: Deng Xiao Ping, Elizabeth 1, Stanford and the Robber barons of America, the Japanese of the 1950s, Park Chung Hee, Chiang Kai Shek. Honest or corrupt, GMA has not performed. At bottom, it is performance that counts. Given my aversion working with this government, but seeing that it could be important to do so, to educate it, to lead it, may I ask you to be in charge of this challenge? While spending little time thinking of ways to work with this government, I also spend little time siding with its critics or friendlies who are also incompetent. They and the administration never suggest Tiger ideas for nation-building. Instead, they blabber on every off-tangent subject, such as federalization or moving gov't offices to the provinces, or parliamentarization. Win large amounts of foreign direct investment inflows so as to have the technology and foreign allies to produce $1 trillion of exports soon, up 24 fold from an estimated $41.5 in 2005? Thus, have jobs more and more Filipinos, until the 10 million unemployed or underemployed Filipinos are virtually fully employed, and they earn big dollars to import productive machines, trucks, computers, technologies? Thus, workers become more productive. The productivity of the other 25 million workers now fully employed soon rises from an output of only $3,500 annually now to the $78,000 output per worker in America, or $70,000 in HK, or $40,000 in SoKor? Thus Filipinos have high incomes, therefore pay big taxes, therefore enrich the government to build more infrastructure and better schools. Thus, the nation gets built? No, no, no.... More like, Warren Buffet Jr. rising. Or HSBC Jr. emerging. Or Dracula flying high at mid-day? Do you know these names-- Buffet, HSBC? Of course you do. You must Google them. Spend time on their web sites. Warren Buffet, HSBC--along with Sam Walton--may be the greatest, or among the greatest, long-term builders of the world in modern times. If individuals are that powerful, why not use your literary and political talents to awaken Filipino individuals to their possibilities, instead of turning them into weak complainers like Walden Bello? Why don't you start with yourself? As a U.P. MBA alum, you must read more on the Japanese economic miracle of the 1950s-70s, and then of the miracles in Tawan, Hong Kong, China, Thailand, Malaysia, S. Korea, Taiwan. Be familiar with the instructive ups and downs of economic policies in Japan and S. Korea, especially the latest policies that has rescued them from the earlier stupid policies of the 1950s up to the late 1980s (or 90s for SK) that pushed them up high, only to plunge them into trouble from there. And read how China copied Hong Kong and admired S. Korea but avoided the chaebol-oriented Korean mistakes. Then go micro by reading much on Warren Buffet and HSBC. Then lead Filipinos, including officials, to the right actions for progress. Don't worry, I'll be there beside you, mano a mano, stouthearted man joined to another. I have found the suggested readings above more exciting and alive than the dead wails and dirges that I get from reading the complaining Bello, Constantino, Lichauco, Recto, and Jo Ma Sison. You must stop promoting their internally-defensive wails and whines and moans. Instead, be be a champion inspiring yourself and Filipinos to grow from fleas into monstrous winning beasts of world finance and commerce. We must be savage Vandals, Teutons, Mongols exploding from our borders into the world, respecting no hunks, no Hulks there, no Knights Templars, no samurais, no kung fu masters. You and we are testosterone, Bert. That means electron. Now let us electrify. Of course you'll ask, How? My somewhat more specific answer now is this: Found a bank or investment company. Become Warren Buffet and HSBC combined. They were fleas with only 250,000 to 50 million pesos of starting capital. But, they flead well and became gnats of finance and commerce. Then they gnatted well and became gadflies. Then they gadflied well and are now magnificent vampires, monsters of finance and commerce. Now go and grow like them, as I am doing with my money management company in New York. Become a Monstron, a Draculon. You have friends with 50,000 of capital no? And they have friends, no? Get going and pool P20 million to P50 million of capital. Then buy into or joint venture with a small bank, a savings bank or rural bank. With that bank, look for foreign investors to ally with at exports. Of course, also develop globally-oriented workers and managers. And work with me to find your small American joint venture partners to export with from the Philippines, if you need my help. Small foreign exporter allies at first. With them grow, and grow and grow to find larger foreign allies with whom again to grow and grow. Thus we rise to become monsterlets as attractive globally as starlets. That would mean big-boobed and seductive enough to buy San Miguel and BPI. So, we are a bigger entity and start promoting bigger foreign joint venture alliances. And we grow and grow and grow into a Brad Pitt of finance and commerce. So we we buy Gloria, Angarra, Ping Lacson, Pimentel, Brother Eddie, Honasan and a couple of American or Korean firms. We'd keep growing. So we buy the International Space Station, and settle on Mars and Jupiter to claim them as our frontiers. From there we negotiate with Klingons and Romulens to buy the Tiger nebulae, if it exists. If not, we'll create it. It is a crazy world out there full of possibilities. If we retain our cosmic ambition, good sense, and some silly humor, and if we stop wailing and moaning about how we are miseducated and exploited by imperial Americans, we'll get somewhere. Thanks for your entertaining comments though they have traces of validity. Performance as bottomline. What is good or bad? if good performance, for whom? I'll go along with you, though I must confess I do not have play money for venture capitalism, especially with your investment company, haha. For my own money, I'd rather stick to my self-managed investments. I got some ideas borrowed from your pal Warren, Pete Lynch, Ben Graham and all those economists who keep on writing "how to invest or get rich quick" cookbooks as their sideline. With your great ideas, you should be able to convince even those creative thieves in government who boundlessly want more money to line their pockets (they might even want to live forever or want golden caskets, I suppose). They may catch on and invest with you. So devote more than 1% on these guys. You might have better luck. Who knows, you make your money and by chance may even help the country get somewhere..(to where)? While I rant about our lack of nationalism....as it keeps me going and contented....as you seem to be in your money talk. I thought performance was well defined. k) thus much road building, and water supply and school construction and environmental clean-up occurs, which is nation-building. l) if there will also be lots of corruption, and environmental degradation, we will have to endure these temporary pimples. m) as workers get rich, they erect better homes. Goodbye Gawad Kaling pig pens. Does the above enumeration of means and beneifts bore you? Sorry, but they need to be listed. I wish you mastered the model. It is all true--the experiences of Malaysia, Thailand, China, in the last 23 years and of India since 1991, and of four little Japans since the 1960s. Gloria did not achieve the above performance record. It would have benefited all members of the export-oriented Philipine alliance-- the workers, the govt, the foreign investors, the people, the nation. Do you see now what performance means? >> For my own money, I'd rather stick to my self-managed investments. I got some ideas borrowed from your pal Warren, Pete Lynch, Ben Graham and all those economists who keep on writing "how to invest or get rich quick" cookbooks as their sideline. I wish you understood teamwork and leverage. One person is good, two are better, 88 million Filipinos are best, and 6 billion global citizens are bestest. A few Filipinos must band together to form a new bank or investment company different from existing Filipino financial institutions that have been weakly led. The few Filipinos would gather savings of Filipinos first, and then of the world next, so that there is big capital to invest. The few Filipinos would get going the process above of accelerting foreign investment inflows. How do you think America or Hong Kong got built?. Through banks and investment companies in America, or in HK collecting local and global money into concentrated bid wads to invest locally. >> While I rant about our lack of nationalism....It keeps me going and contented....as you seem to be in your money talk. You really should stop ranting on nationalism that leads nowhere. The right nationalism conquers world markets, with Tiger multinational allies to do it with. Rant on that... and realize your rant. You should be into what you call my "money talk," an unfortunate phrase, in my view. Makes me think of the three bricklayers. Asked what they were doing, one said, "laying bricks, the second said, "building a wall," and the third said, "erecting a great cathedral." You make me think I am only laying bricks. You should be into what I'd call building a cathedral of a nation, with finance at the lead, capital at the lead. In short, get into capitalism. Don't worry, after capitalism, we will get to socialism, but not now... perhaps in a few... ... paragraphs? No, more like one century or two. We'll be so productive in one or two centuries, that private property will be meaningless. Want to go to Paris. No problem, Scotty will beam you there. Or, want to go to Tiger Nebulae. No problem, the Starship Enterprise will get you there at Warp 9 speed. Want Cleopatra? No problem, the computer will consult a database, pluck atoms from the air, and manufacture Cleopatra for you to have your way with. Want a Rolls Royce? Ah... you'll be bored... The computer can make it for you from thin air any minute. I am an anarchist, but also a contradiction. I love the NCAA and teamwork. I adore American, Japanese, Korean, Chinese companies in the abstract, and the teamwork in there. You should see yourself as a potential team leader, an organizer. Every Filipino intellectual appears to only like to stand on a soapbox. You've seen the Wizard of Oz, yes? We'll, no matter who you are now, you can be a bold man, a leader, a nation-builder. Just say so, just fool yourself into believing it... and then keep up with the illusion.... You'll get somewhere... at least that is what I must tell myself each day. Illusions are so powerful and productive, if they are positive illusions. Your five assignments are these: 1) Get off the soapbox, and run away with my ideas. Use them as if they were your own; 2) Get other leftists to think the same way. 3) You and they organize your own investment company or bank. 4) With it build a cathedral, er... something larger... er the world? the galaxy? 5) When you succeed, teach me how to be that good. I won't talk to you for two or three years. Above assignment will require time and concentration. After you succeed, teach me how you did it. You've started well, reading Buffet, Lynch, and Graham Bell... er.. Ben Graham. How did you get stuck with Constantino, too? Don't explain. I understand. You've been an NNN -- nattering nabob of negativism. Hello! Hello! Im just about to ask wen will u be posting the last part? Can u please post it sooner.. Pls. pls. Pls..
please send me the copy of the "Miseducation of the Filipino" and "Pambansang Demokrasya" at joanne_valkyrie@yahoo.com. Thank you! hi. please send me the Miseducation of the Filipino and Pambansang Demokrasya at joanne_valkyrie@yahoo.com. Thanks! 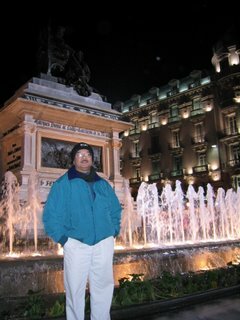 Am currently in Spain and will be back home 12/09. Will email back then. Thanks!! hi,,,please send me a copy of "The Mis-education of the Filipino People at this e-mail address(joy_amores82@yahoo.com). it is indeed the miseducation. not a malpractice. in the first place, when we were colonialized, it is not education for the filipinos, of the filipinos and by the Americans. but rather Education of the AMericans, for the AMericans and by the Americans. i totally agree with what mr. constantino wrote. the reason why we are in the call-center and ofw period. Please indicate the date of your request in your message/comment, as this section does not say. Then I'll know if I have timely responded to your request. Visit my SCRIBD website as mentioned from which you can download. A Filipino mind MUST also THINK in Spanish.